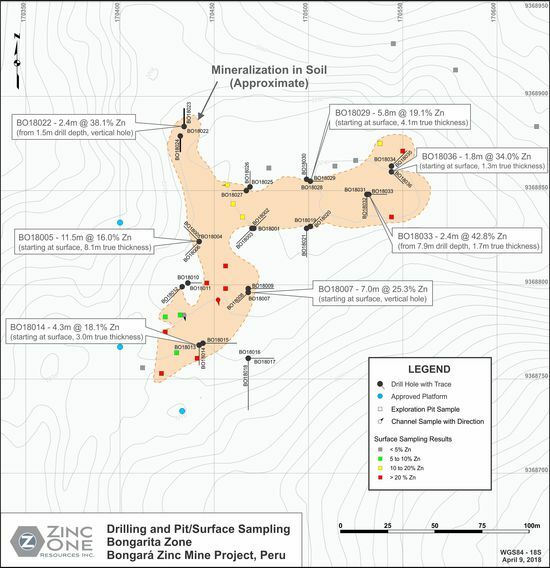 Zinc One Resources Inc. (TSXV:Z, FSE:RH33, OTC:ZZOF) (“Zinc One” or the “Company”) announces the final drill results from the Bongarita mineralized zone subsequent to the results previously reported (see news release from March 29, 2018). Zinc One Resources Inc. (TSXV:Z, FSE:RH33, OTC:ZZOF) (“Zinc One” or the “Company”) announces the final drill results from the Bongarita mineralized zone subsequent to the results previously reported (see news release from March 29, 2018). The Bongarita zone is one of several high-grade mineralized areas being targeted in the ongoing drill program at the Company’s Bongará Zinc Mine project located in north-central Peru. 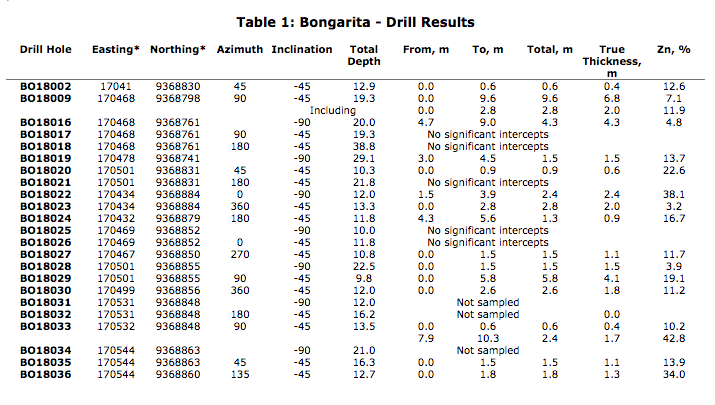 A total of 36 holes for 587.2 metres were drilled at Bongarita. Very fine-grained zinc mineralization, mostly as silicates exclusively hosted by soils, has been delineated over an area of approximately 7,500 square metres. Click here to connect with Zinc One Resources Inc. and receive an Investor’s Presentation.